Laura combines expertise in consumer behaviour with an understanding of diverse client needs to create targeted marketing solutions and support marketing strategies. She brings extensive professional writing and project management experience, which she uses to communicate Nous’ brand and message and support the implementation of marketing campaigns. Laura also draws upon her analysis and process improvement skills to drive innovation in marketing, customer relationship management and client development. Analysed consumer behaviour pertaining to aged care, telecommunications and obesity for state government organisations and suggested appropriate social marketing strategies. Laura previously worked in a marketing agency and as the marketing coordinator of a start-up. 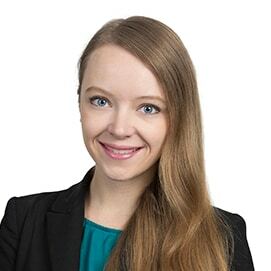 She also conducted research in consumer behaviour for Deakin University and worked as a project coordinator at IBM; after commencing her career as an analyst at the Australian Department of Defence, focusing on human behaviour. Laura holds a Master of Marketing from Deakin University and a Bachelor of Arts (Dean’s Scholars Program) (Honours in sociology) from Monash University. Laura has played trumpet since she was 10-years-old, especially in stage bands. She also plays netball, frequently travels South-East Asia and dabbles in musical theatre and deejaying.